When the sun has reached its highest point in the summer sky, and the warm air chases away any lingering memory of winter’s chill, that’s when you know it is time for barbequing. Of course, maybe you are the type to brave the cold just to get the perfect steaks. And why not? BBQ grilling is one of life’s most pleasant experiences. Everyone has their favorite pan-seared meat and vegetable dishes that they bring to the table on a regular basis. These foods tend to be cooked in fats that add a considerable caloric punch while also putting your cardiovascular system at risk. Even baked foods have a tendency to sit in the trans-fats that pool on the bottom of the pan, ultimately making their way to your plate. Grilled meat does not have this problem! All of the unhealthy fats from cooking run off the meat, basting its outer layer on the way. Best of all, there’s no need for oily marinades as a simple saltwater brine with spices is all that is required to make even the toughest-to-cook foods, like chicken breast or thin-cut pork chops, turn out moist. You may think this claim is a bit presumptuous, but there is sound scientific reasoning behind it. The chemical process that is responsible for that crispy, flavorful browning on meats is called the Maillard Reaction. Without getting too technical, this is what happens when proteins are denatured by heat and then recombined with natural sugars. The Maillard reaction is responsible for that “meaty”, umami flavor everyone loves. Because grilling is one of the most controllable cooking methods, you can get an even heat across your grate. This means more of the meat gets seared, and the crust is thicker than what can be achieved on a stovetop. Foods like steak are especially tasty when prepared on a grill because it is difficult to get a pan to a high enough temperature to avoid steaming away any crust that forms. Whether you have chosen a clean-burning gas model or a time-honored charcoal grill, you are going to have to do a little maintenance. “How can extra work be a good thing?”, you ask? The answer is because it will benefit the meals your prepare going forward. “Mike Johnson from GrillTanksPlus.com says that the quality of your BBQ improves as you maintain and clean your grill on a regular basis. Like many other cooking implements, you will find the grill surface sticks less and sears better with proper maintenance. There is simply no substitution for properly seasoned cookware, and your grill will reward the effort. Every cooking method has its own strengths and weaknesses. 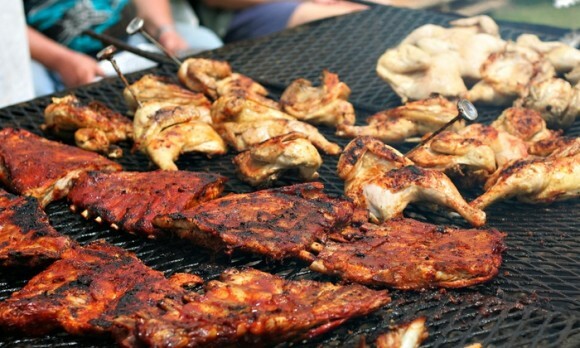 Perhaps barbequing’s greatest strength is found in the unique food experiences it produces. Beyond the Maillard Reaction, there are a whole host of other flavors you can achieve on a grill. Charcoal grills impart a rich smokiness that complements meats and vegetables well. You can enjoy entirely new flavors simply by adding different types of food-grade woodchips to the fire, customizing your BBQ dishes. Likewise, you will find sauces caramelize into a decadent glaze that you cannot get in the lower heat of an oven. Many adults are not getting enough fruits and vegetables in their diets to support a healthy lifestyle. If that sounds like you then grilling may just be your ticket to a whole new appreciation for those much-maligned greens while improving your health. The smokiness and flame-seared taste of vegetables cooked in the barbeque transforms bland side-dishes into a centerpiece of any meal. Onions, peppers, and corn take on a delightful smokiness as their outer layers take on a light char and their sugars concentrate. You will find the texture of potatoes become silky-smooth in a way no oven can manage. Grilling gives you an excellent reason to try those vegetables again. Lost in the many thousands of unique grilling recipes, entertaining cooking methods to try out, and sumptuous smells to savor is the simple joy of spending more time with the people you love. Kitchens can be busy places. You often need all the space you can get to move around at a frantic pace if you want your meal to be a success. Grilling takes the insanity out of mealtime, getting you outside to enjoy the fresh air with your friends and family. At the end of the day, the best meal is the one we share. That is reason enough to get excited about grilling, all by itself.